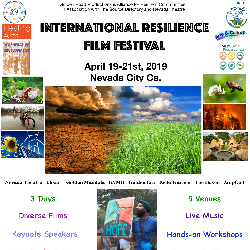 Golden Road Productions in collaboration with the Alliance for Resilient Communities presents the first annual International Resilience Film Festival. In honor of Earth Day, April 19-21, we present a weekend of cutting edge films, keynote speakers, workshops, and live music. We are at a unique point in history where the negative implications of environmental exploitation, mismanagement of natural resources, and related cultural appropriation and genocide, and human injustice, accentuated by the reality of climate change and globalization, invite us to consider the important role of independent media and appropriate use of technology in creating sustainable and regenerative change locally and globally. We recognize the importance of innovative approaches to environmental protection, sustainability, regeneration, and the role of the public and private sectors in identifying problems and highlighting solutions in changing the current paradigm of profit over people. Communities and ecosystems demonstrate the power of cultural and environmental resilience and resistance in the face of harmful structures and systems. Thus, resilience is a framework to understand how to build an infrastructure in a way that will survive the unexpected, provide operational flexibility, and work within natural systems. 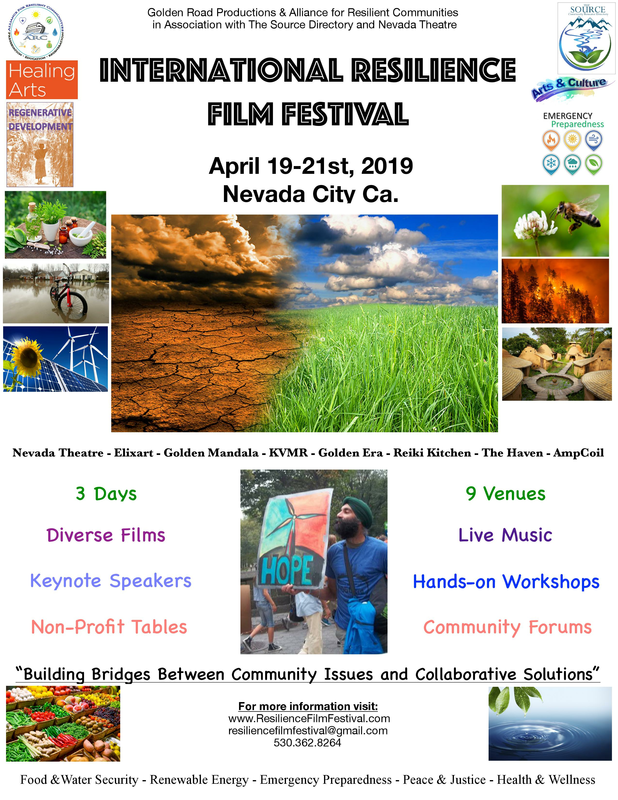 The main goals of the film festival are to engage in innovative solutions, awaken activism in the process of social, cultural, environmental, and economic change, inspire and empower individuals and communities to take ownership of their health and wellbeing, and to initiate concrete change for the benefit of future generations. Nevada City, certified nationally as a historic and cultural district, is an ideal location to host the event based on the natural beauty of the Sierra Nevada Mountains, the outdoor recreation and beauty of the Yuba River and Lake Tahoe area, access to cutting edge technology and broadcast resources, the proximity to the Bay Area and the State Capital, and the great number of organizations dedicated to a better quality of life in the neighboring counties. The International Resilience Film Festival is seeking films that holistically address community and environmental resilience and regenerative concepts and strategies in: Agriculture & Food, Art, Music, & Culture, Emergency Preparedness, Economic Development, Energy, Environment & Climate Change, Health & Wellness, Housing & Tiny Houses, Indigeneity, Peace & Justice, Science & Technology, & Water Security.